Instagram is no doubt one of the most popular apps on the iPhone, and we understand why. The photo-taking-and-sharing app is a great way for iPhone users to document their everyday lives and let’s face it — the vintage-style filters make almost any iPhone photo look like an artistic composition. With that being said, it’s no wonder that Instagram users have taken a liking to creating photo books, calendars, and other products featuring their iPhone works of art. Most of this isn’t exactly revolutionary, but we do think that our Instagram photos would look pretty cool on a slick case like those in the above photo. We’re not sure why every Instagram-related product feels the need to adopt part of the iPhone app’s name, but we like the idea of this fun service that turns your Instagram photos into a personalized plastic case for your iPhone 4 or 4S. With Casetagram ($35 per case), users can sign in with their Instagram accounts, choose a layout and design, and have a custom-case made and shipped to them. You get an option of a transparent or white snap-on style case that will protect your iPhone and show off your Instagram prowess at the same time. 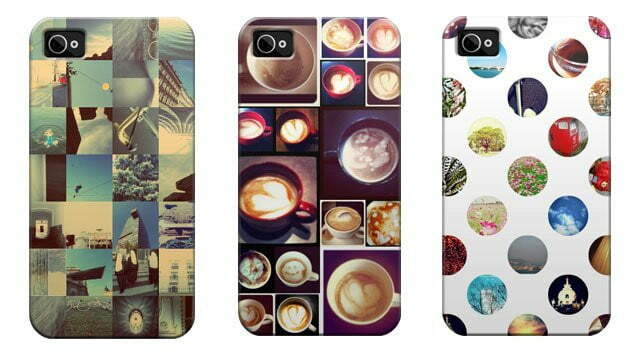 There is a gallery of stylish cases by Instagram users on the Casetagram site, but only you will be able to order a case with photos from your account.